Hey ladies, August is about to end which means Homecoming in the US is fast approaching. For those who aren't familiar, Homecoming is the tradition of welcoming back alumni of a school. It most commonly refers to a tradition in many universities, colleges and high schools in the USA. After a football game it is usually followed by a Dance (source wikipedia). 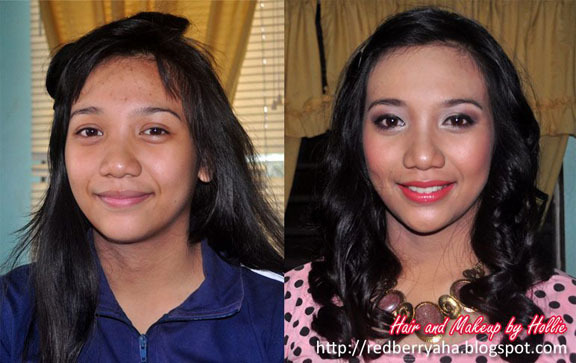 This a makeup look that I did for my younger sister earyly last year. It was for a Debut celebration she was attending and I think this look would also be perfect for Homecoming. Homecoming will not be complete without stunning Homecoming dresses to pair it with. I stumbled on this site called DressFirst. They offer a wide range of dresses at an affordable price and often times they have dresses on sale for up to 70% off. The best thing is that they offer Free Shipping and they also ship internationally. This is one of the dresses that I really liked from the site. It is a One-Shoulder Mini Chiffon dress. I find it simple yet elegant and color is very pleasing to the eye. I also love that each dress comes with a detailed description about the cut and fabric.